Two PCRM billboards in Albany, New York are shocking locals with their strong anti-dairy message. 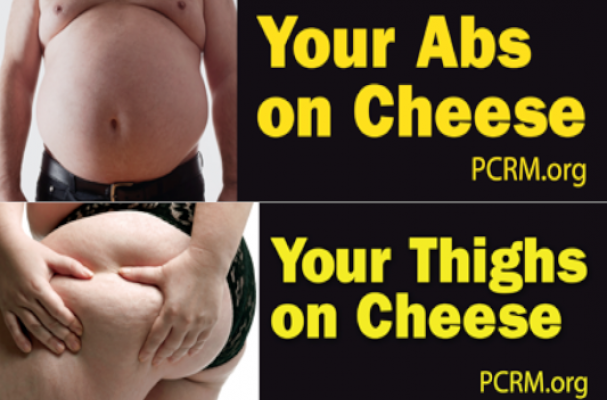 The ads show photos of overweight individuals with the ad copy "Your abs on cheese" or "Your thighs on cheese" and a link to the website of the Physician's Committee for Responsible Medicine. Neal Barnard, M.D., is the president of PCRM; he wrote a letter to the Albany school board imploring that the city severely cut down on the dairy products it serves in schools. Barnard wrote that such an initiative would curb childhood obesity. It is not accurate or responsible to suggest that a person cannot be thin while eating cheese, or fat on a vegan diet. While the standard American diet contributes to obesity, not all carnists are fat, nor are all vegans thin… The fat-shaming images are unlikely to make anyone feel as though they will be accepted in the vegan community, perpetuating the stereotype that vegans only come in one size. What do you think of the PCRM billboards and the message they convey? PCRM is a vegan group closely associated with PETA. Not credible in the least....their agenda has nothing to do with the health of people, it is all about animal rights. deny what you want. Fat is Fat. and it's killing us. period.